This morning I received an email message from Tom Mair, a Green Party candidate for the Grand Traverse (Michigan) Board of Commissioners, who wanted to know what I thought about the decision in June by Traverse City Light and Power to abandon its proposal to build a wood biomass plant. I served as communications and engagement consultant on the public hearings the utility held this winter. where are you on biomass and TCLP now that the TLCP board seems to have shelved biomass? I’m concerned about biomass in Michigan… is there any regulation of the number of plants (that’s power plants) and the capacity? Seems like there should be. Otherwise every town could build one. Before long there would be too many plants and fewer plants to cut down. I’m running for GT County Bd of Commissioners Dist 7. You raise good questions about oversight and management. The TCLP proposal included a sustainable forestry initiative to assure steady fuel supply. After all, what sense does it make to build a biomass plant that couldn’t secure fuel at an affordable rate, causing electric rates to rise? By the way, TCLP had a plentiful supply of fuel from cherry orchard tree wastes, which are routinely burned in giant bonfires with no emissions control or harvesting of heat value at all. The easy politic here is the flat out lying, exaggeration, misinformation, and fear-mongering of opponents. It was eye-opening to me and reflected the stiff resistance at the grassroots to clean energy projects. I’ve written extensively about that on my ModeShift blog. Check out the bottom of this piece. Clean energy development is dividing American environmentalism in interesting and potentially harmful ways. The inflexible ideological wing, expressed by TC biomass proponents, essentially wants to do nothing different. The risk of doing something to take care of baseload generating needs was rejected, and the utility’s 30 by 20 goal is likely dead for a good while. That’s a shame if you are convinced that anything we can do to reduce the effects of climate change are worthwhile. I’ve worked and reported on the climate and energy sector for years and know there is no easy answer. Some in the TCLP public meetings called for more natural gas generation, but the risks of doing that have been very high in the Antrim play — shredding the forests with 10,000 well pads and thousands of new miles of roads and pipelines. The risks of the new deep shale play are unknown in Michigan but similar formations in other states are raising havoc with water supplies. I also wonder whether Traverse City residents are any more willing to build a right-size natural gas-fired plant within city boundaries. Some called for reversing a public decision two years ago and rebuilding the Boardman dams, which generate 2 mw. The cost is high and the environmental goal of restoring the river’s natural flow would be halted. Some called for more efficiency, a good idea and well worth pursuing, as TCLP is doing with more success than most Michigan utilities. But saving energy doesn’t replace the need to also generate it. It also doesn’t obviate the need to replace coal-fired baseload generation. Some called for more wind, which TCLP is executing. Wind has an important role but is intermittent and doesn’t replace the need for baseload energy. So the utility pursued a path I call radical pragmatism. If your goal is to reduce reliance on coal, the dirtiest and most resource-wasting fuel there is, and you want to do so with a local source of renewable energy to replace baseload coal-fired electrical generation, then TCLP had a reasonable response. Build a right-size, 10 mw, clean-burning, state-of-the-art, wood-burning, gasification plant that generates heat and power and makes a lot of sense. It generates half the C02 emissions of a coal-fired plant and burns much more cleanly than the wood-burning stoves that operate in the northwest Michigan homes of its critics. It produces no mercury to contaminate water and fish and no heavy metals, like a coal-burning utility. It will never account for anything like the 29 mining deaths that occurred earlier this year in an Appalachian coal mine. And it produces little if any of the health-threatening particulates that the sham “authorities” contended would sicken women and children. In fact all those light trucks, SUVs, diesel-powered, and gasoline-powered cars the critics drive each day actually produce and stir up health-threatening particulates, as do the western strip mines and coal-burning power plants that provide the region’s electricity. Lastly, building that state-of-the-art biomass plant would permanently employ 20 or 30 people in good benefits-paying jobs and keep in the community the $4 million dollars that TCLP is sending each year downstate to generate power and to western strip mines and railroads to bring the fuel to Michigan. As you can see I’m no politician. It’s just clear to me that when weighing the risks and benefits a right-sized modern biomass plant makes more sense than what’s almost certain to occur now. TCLP will be forced to sign contracts with coal-fired utilities to provide Traverse City electricity at reasonable cost. 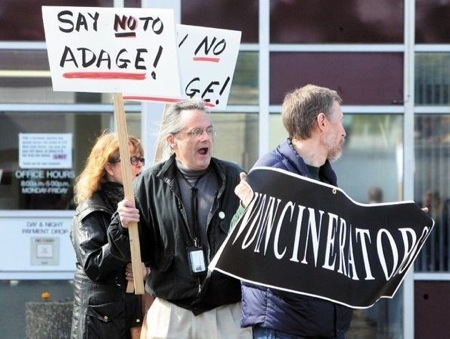 One of those contracts could be with a proposed new plant in Bay City that some of those very same biomass critics have been fighting, in order to block its construction. What happened with the biomass plant reflects all kinds of social and economic trends that are colliding, including an oppressive fear of the future that has produced a crippling politics of stasis — on the right and on the left.